Get A Clue 7: Jingle Spells 2! ON SALE NOW! It is our seventh Get a Clue fundraiser, and it is our best yet. Last year, for the holiday season, Leaky, in cooperation with 14 wizard rock bands, produced a charity compilation CD that raised more than $35,000 for literacy. So we are doing it again. 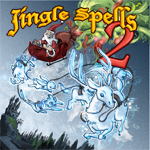 Presenting Jingle Spells 2, a bigger, better, more festive, more fun, more attitudinous, holiday wizard rock compilation. This time we have 18 songs, from old and new favorites. We said it last year (and you all seemed to agree) so we’ll say it again: even if you don’t like wizard rock, we are sure you’re going to love this. It is all-new music, form 18 bands. Buying the album is the only way to hear the music on it. It is a perfect holiday gift for yourself or anyone else you know that loves Harry Potter. It’s for a good cause, it’s inexpensive – it’s a holiday gift and a good deed all rolled into one. This album is selling for $15, which includes shipping in the United States (there is a $3.60 surcharge for orders outside the U.S.). It is available for preorder NOW at this link, or just right here! ALL PRE-ORDERS WILL BE SHIPPED OUT IN THE FIRST OR SECOND WEEK IN DECEMBER. E-mails asking where your order is, before it is reasonable to expect your order has shipped, will not be returned. We are ONLY SELLING 1,800 copies. In Mid-December the album will become available on iTunes; buying a printed edition is the only way to get the original artwork (done by Frak!). Remember: There is a LIMITED number of copies and fewer physical copies than last year (because of our crunched schedule) so get it now! Every penny of profit will go to aid the efforts of Book Aid to help promote literacy worldwide, and The HP Alliance to help realize the messages of Harry Potter in the real world. Still not convinced you should order? Give the samples below a try. Those who ordered copies last year will be getting a special e-mail shortly, so if you aren’t on that list, we strongly suggest ordering your copies NOW.